OR whatever mix-ins your heart desires! Refrigerate the dough for 30 minutes or so. 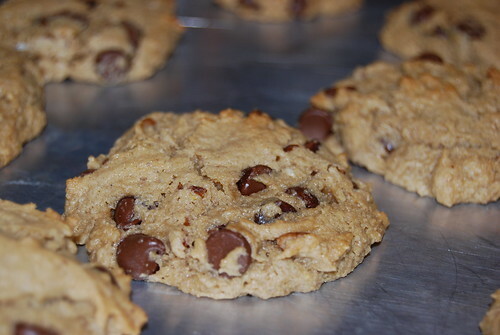 Place tablespoons of dough on a cookie sheet. (I like Airbake pans or Pampered Chef Stones for cookies.) Then bake at 375 for 10-12 minutes. The cookies came out very tasty! They are a nice chewy consistency with a good flavor. *Right now I am using Bob's Red Mill GF AP flour. I don't really care for the taste of it so I think I'll try to find a different brand of AP flour or just make my own blends of flour in the future. If you are trying the Bob's raw, I will not argue with you. It is AWFUL raw and it stinks as well. Tastes fine after baking, though. Yeah, it is fine after baking. I still don't like it as the only flour. I've used it for other things and have figured out that it is better mixed with other things. www.glutenfreeflour.com has a good non-offensive tasting AP flour. It works well for cookies I've discovered.